Whether one believes in God or not, this is a sin, and a sin so shameful, so filthy, so abject, and so contemptible, that it doesn’t seem strange that we should go to great lengths to cover it up, to forget it or to excuse it. Zapatero [the prime minister of Spain] has sent the Spanish army to kill a panhandler who stretched out his hand, much as neo-Nazi gangs do with those sleeping under corrugated cardboard boxes, and Spain applauds or keeps its counsel. Carlos Fernando Liria published in these same pages [see “La COPE se troncha de risa con los sucesos de Melilla” at Rebelión.org] the COPE’s [Spanish Catholic radio] joke, celebrated by thousands of listeners, about the olympic event of “pole vaulting to Spain”; José Daniel reminded us of Libertad-Digital’s [Spanish right-wing internet portal] nasty ravings about this “invasion” that is not being repelled strongly enough; and it suffices to read the headlines, stories and editorials in El País [centrist daily] and El Mundo [conservative daily] to see all this undisguiseable shame spewing forth in euphemisms, circumlocutions and asides as clever and fragile as glass wool: “Melilla lives up close the drama of immigration,” as though the Melillans were the victims and as though it were a matter of living it from afar; “dual perimeter of border-proofing,” a sinisterly hygienic euphemism that hides a wall bristling with barbs under an antiseptic technical jargon and dehumanizes those attempting to jump over it; “some have died in the attempt and others carry on their bodies the results of this desperate act,” as though they had merely hurt themselves while mountain climbing; “their situation puts in question the Moroccan kingdom’s moral values,” because the kingdom of Spain, in effect, would rather Morocco killed them along the way, as agreed upon, leaving up to Muslims a job Christians cannot undertake lest their moral values be called into question and lest they choke on the powder doughnuts of democracy and human rights with which they endlessly stuff their mouths. There are contradictions that can only be resolved with a lining of emptiness; that is to say, with ever increasing armed nihilism. If a soldier devotes himself to torturing prisoners and, on his evening returns home, aspires to be an example to his children, those prisoners must be nothing to him. If a society unwaveringly chooses Africa’s poverty and has to contain it with blows whenever it threatens our culpable well-being and whenever that society, moreover, wants to preserve its values and its feeling of moral superiority, that society has to convince itself that those Africans are as deserving of their fate as we are of our supermarkets and our wheels. The Melilla Wall is as natural as the Mediterranean Sea and as fair and just as the light of day. But that wall that rends the world in two, seamlessly and unqualifiedly, is also a screen upon which are projected two undisguiseable contradictions that are easier to forget elsewhere. The first has to do with the direction and the very possibility of the movement of persons in an unequal economic playing field in which formally homogeneous nation states have the unequal power to impose their sovereignty. International conventions and local laws, in line with United Nations declarations, recognize and demand that citizens’ individual right to leave their countries be respected. But those same conventions and charters, in line with United Nations declarations, leave in the hands of states the right of entry. To leave is an individual right; to enter, a state’s right. In an unequal economic playing field, where sovereignty is likewise unequally apportioned, if Spaniards seem to have the individual right to enter Morocco or Indonesia, that is only because the Spanish state has enough power to weaken and to bend Morocco’s or Indonesia’s sovereignty; if the Senegalese, the Nigerians or Moroccans themselves seem, on the other hand, not to have the right to leave Africa, that is only due to the fact Spanish sovereignty is powerful enough to prevent them from entering Spain. In fact, the Spanish may enter Morocco or Indonesia because they are not persons but rather impersonal manifestations of a sovereign state; in fact, the Senegalese cannot leave Africa, because they are only defenseless individuals disconnected from states without sovereignty. Paradoxically and against appearances, freedom of movement is only forbidden to individuals. This contradiction, in any case, allows Western states — while they are not obliged to fire upon walls — to be morally outraged at the restrictions formerly imposed in the Soviet Union or East Germany3 against those wanting to leave their country, while at the same time permitting them to rescind de facto that same right, without violating any commandment, nor questioning their own values, and to bar the entry, by any means, legal and/or violent, of those who would individually leave their occupied and frayed countries (countries that have been transformed into veritable “containers” through bilateral agreements with more than doubtfully democratic governments). But this contradiction also determines, and is the precondition for, a dual displacement on the ground, in opposing directions — ascending and descending — that coincides with those actively political figures we call respectively a tourist and an immigrant. Every year millions of Western tourists — as abstract repositories of a superior sovereignty — freely enter Egypt, Bali, Morocco, and Tunisia, while millions of Latin-Americans and Africans are refused, as purely defenseless individuals, at the borders of the United States and Europe. In fact, and structurally speaking, immigrants are just that from birth, now and forever after, as demonstrated by the fact tourists, for their part, travel equipped with, and impose wherever they go, their own Melilla walls: hotels fenced-off with powerful security systems, private beaches, tracks closed-off to the natives, who can only penetrate them crouched and clandestinely, and who are always considered importunate, bothersome or suspect. But in this way, in the context of an inequality of sovereignties that vetoes the movement of persons — and only these — and that confronts tourists and immigrants without regard to where they are, Bali, Egypt or Kenya’s bombs are merely the equivalent — less damaging and in miniature — of Western “migratory policies that, just in the Strait of Gibraltar and in the border between Mexico and the United States, have claimed the lives of 35,000 persons. The logic of Libertad-Digital, COPE, El Mundo, and El País; that of our politicians and of Spanish public opinion, compels us to view the terrorist attacks against Western tourists as legitimate vehicles of restrictive sovereignty, on an equal footing with the iron curtains, the gunning down and deportations of Sub-Saharans in Melilla. 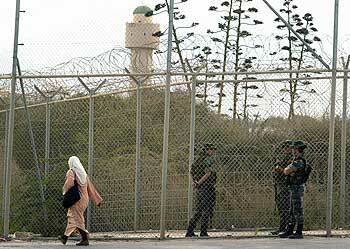 The Melilla Wall is therefore an incitement to terrorism and a legitimation of its effects. The second contradiction of the Wall is an extension of the first and has to do with the well known paradox of Human Rights. Against the universal tenets of the French Revolution, the reactionary Joseph de Maistre argued that in the world there was nothing we could call persons, rather only Spaniards, Frenchman, Englishmen and even Persians (if Montesquieu’s account were accepted). This well-aimed barb laid bare, a century and a half afterwards, the absurd and tragic consequences of seeming to defend human rights in an unequal economic playing field governed formally by the Nation State. Hannah Arendt has called attention before to the fact that once they had been stripped of their homeland, family and money, and reduced to their pure human essence, those stateless persons and refugees of the Second World War remained for that same reason at the margins of the law. Pure individuals, the men and women who climb over the Melilla Wall and destroy their passport in order that they not be returned to their sub-sovereign nations, deprived therefore of any ward, resourceless and stateless, are changed into persons, into mere persons, and have no more than their bare human condition with which to resist. And precisely from that moment forward, and on account of that itself, they cease being subjects of the due process of law and their fate is the desert. The reactionary Joseph de Maistre was right and what makes him right is that selfsame capitalist neoliberalism which, at the same time, goes on extolling the sacred and universal nature of human rights. Persons, as persons, do not here and now have any rights and anyone who is not something more than a person, anyone who is not something more than an individual — a Spaniard, a millionaire or a Mafioso or a combination of these three things — can only aspire to being jailed or killed. The Spaniards who stroll through the square in Marrakesh are nothing in and of themselves; and their self-assuredness, and disdain for others, their presumed invulnerability, is not the result of anything they have done or deserved but exclusively the result of their ownership of a passport whose aleatory value can suddenly disappear into thin air. The beatings and outrages perpetrated against the Sub-Saharans in Melilla are something more radical and frightening than racism: they are the manifestation of a belligerent and potentially homicidal anti-humanism. The worst thing that can be said about someone is that they are only persons; the worse thing that can be done to someone is to treat them as if they were a person. There is nothing in this world more dangerous than to be simply a person. Or perhaps yes, perhaps it is still worse to be … Senegalese. I propose to COPE that it propose to the organizers of the Paris-Dakar rally they award a few extra seconds to those pilots who, in their spellbinding race through the desert, run over an African child so that that child cannot travel to Spain in the future. And I propose to al-Zawahiri that he propose to Al Qaeda awarding a few extra seconds of paradise to the natives who would break some tourist’s leg in a souvenir shop in Bali or Cairo, so that that tourist doesn’t come back to these countries on vacation. The nihilism of the former and the latter comprises the sinister logic of things, even as the innocence of its victims is unequal and the opposite of what it seems to us. The difference been Western Fundamentalism and Islamic Fundamentalism, in any event, is that in the West, fundamentalism is already in power and is followed, voted in and cheered by the majority of the population which, besides, travels to all the corners of the world, unmolested, and in shorts. Originally published Oct. 10, 2005 in Rebelión.org (Leftist Internet portal), Spain. Translated from the Spanish by Flávio Américo dos Reis. 1) Recently, Spain announced that it planned to build a third fence to separate its enclaves of Ceuta and Melilla from the rest of the African continent, according to Rome’s InterPress Service, and is using the most advanced technology to keep out undocumented immigrants — a move that has raised vocal criticism and given rise to countless questions. Among dissonant voices is that of Franco Frattini, the European commissioner for justice, freedom and security, who is quoted by IPS as saying “Europe cannot become a fortress” and “must do all it can to avoid sending this kind of negative message” to other countries, and who also added that measures of the sort will do little to solve the problem of illegal immigration. Asked on Tuesday, Oct. 4, during a news conference in Brussels about this, he commented that it would unfortunately be the first such “wall” built in Europe since the fall of the Berlin Wall. The enclaves of Ceuta and Melilla, in Morocco, to which Spain lays claim, date back to 1497 and 1580 respectively, prior to the existence of the kingdom of Morocco. One of the most recent attempts to scale the double fences surrounding Melilla occurred on Wednesday Oct. 5. Many of the 65 migrants who made it over the razor wire fence were injured. 2) The aid group Doctors without Borders reported the week of Oct. 9, that Moroccan authorities had abandoned some 600 to 700 Africans in a desert region near Morocco’s border with Algeria without food or water. 3) As IPS reminded its readers, the most recent European precedent was the 155-kilometer Berlin Wall in the former East Germany in the East European communist bloc. By the time it finally came down in 1989, and although thousands successfully made it across, still 267 people had been shot and killed in their attempts to climb over the wall into West Berlin. Presently, Israel is also in the process of building a wall on its West Bank to keep out Palestinians. The United States, too, has built high fences and walls along its border with Mexico.